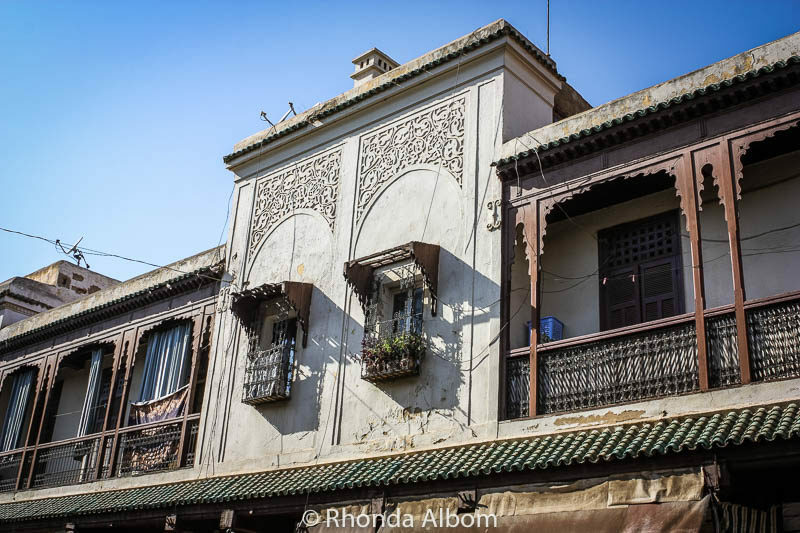 Large windows and open balconies signified our arrival to the Mellah, the old Jewish quarter in Fes Morocco. These dwellings stand in contrast to the typical homes of Muslim families with their often small and hidden windows. Jewish history in Morocco dates back to the 8th-century, and as recently as 100 years ago over 250,000 Jews lived in Morocco. Substantial emigration began with the establishment of the state of Isreal in 1948, and the Sephardic communities in Morocco declined dramatically. 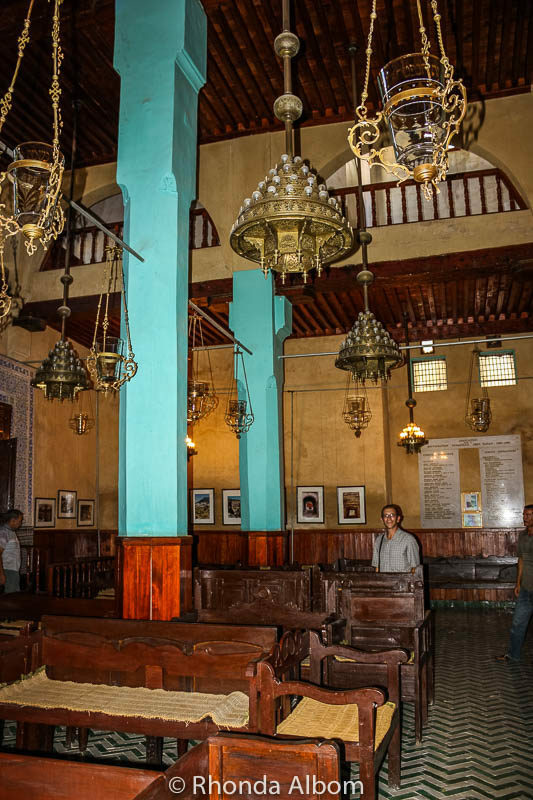 Today it is estimated that only 3,000 Jews remain in Morocco, most in Casablanca with only 150 still in Fes. 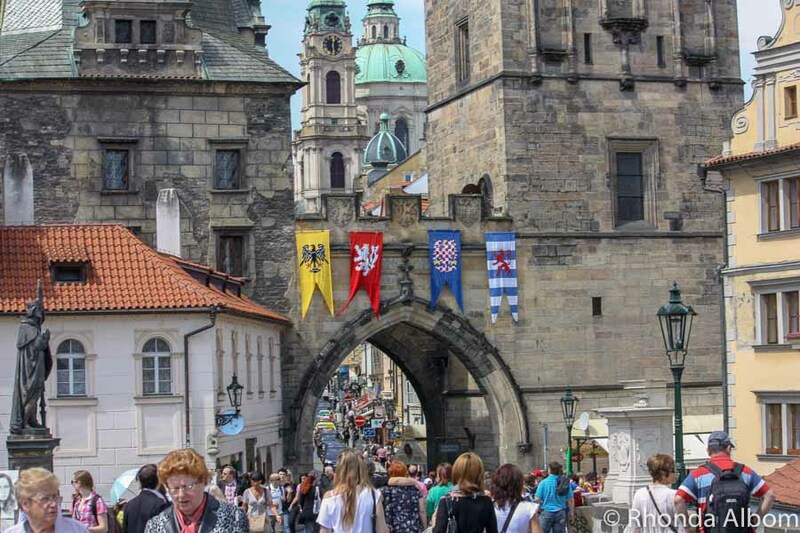 The appearance of balconies on the houses was a sign that we had found the old Jewish quarter. These are in contrast to the traditional Arab houses that have huge indoor courtyards, but a limited view to the outside. Even with a map in hand, the labyrinth of narrow streets running through the old Jewish quarter was challenging. 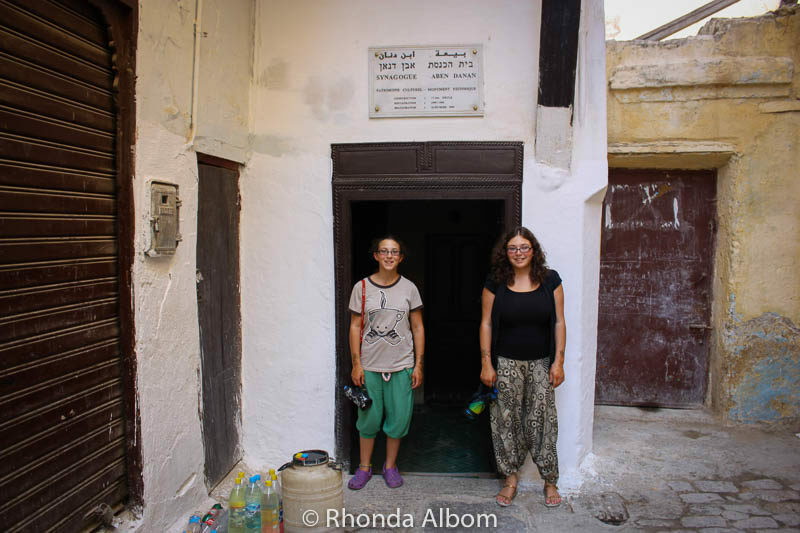 We were in search of the Synagogue Ibn Danan. Impressed that we were able to find it so easily, we took this photo of the girls standing under the synagogue’s sign before going in. This is what it looked like beyond the entrance. Confused, we cautiously walked to the end of the narrow hallway where we found a not so welcoming flight of stairs to the left. As this was the only open doorway, hubby went up. It led straight into someone’s apartment. Luckily, the man asleep on the couch didn’t notice him, and we left in a hurry. At this point, we decided we needed a bit of assistance. Despite warnings from our Lonely Planet Morocco guidebook about “false guides” in Morocco, hubby found a guide who turned out to be quite knowledgeable. He took us first through this doorway. Next, we walked down a long hallway. Some of the windows overlook the Jewish cemetery. We were not able to enter this old Jewish cemetery, but we could see it through a fence. 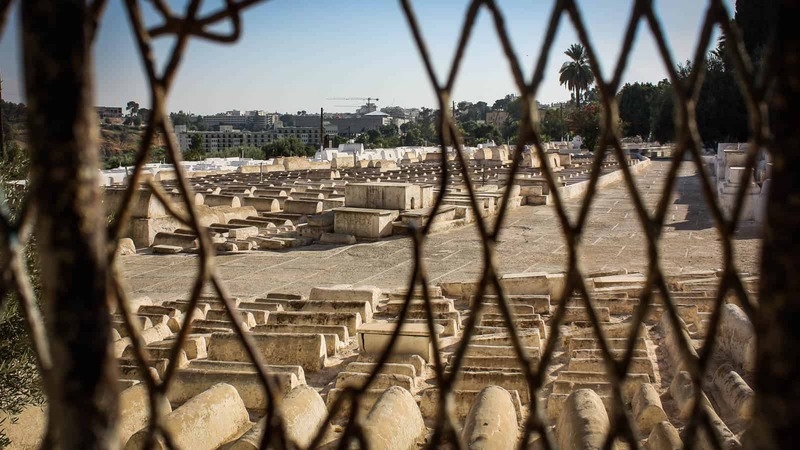 The cemetery overlooks the newer portion of the city of Fes. Our guide pointed out that in a Jewish cemetery in Morocco, graves can face any direction, while in a Muslim cemetery, all graves face Mecca. Next, he led us back to the synagogue sign and into the blue hallway we had previously left. He located the caretaker who opened one of the doors in the hallway. We walked up a small flight of stairs and entered this beautifully restored 17th-century synagogue. This is similar to our experience getting into the Jewish synagogue in Marrakesh. 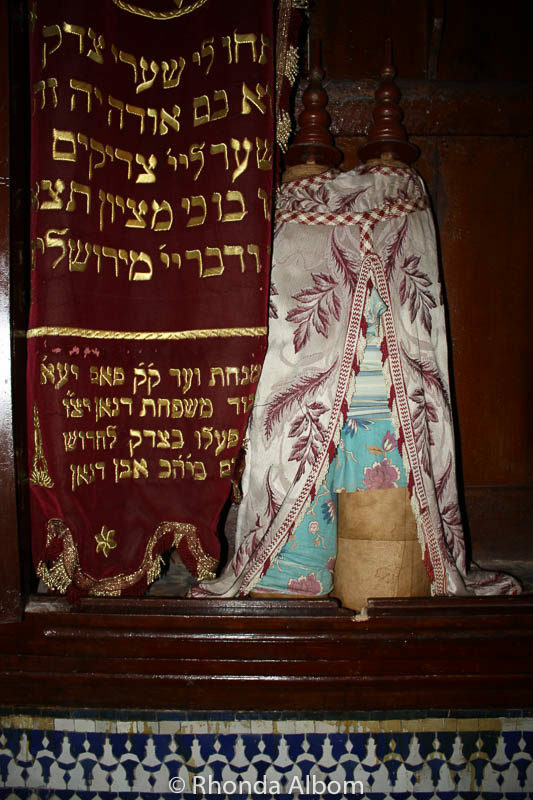 We felt honoured to be shown the Torah in the synagogue. The caretaker also uncovered and showed us this hole that allows family members to protect their women by keeping watch over the mikva bath below. Stray cats seemed to be everywhere in Fes, including the Jewish quarter. We have visited Fes twice, as it is my favourite of the imperial cities in Morocco (Casablanca, Rabat, Marrakech, Meknes, and Fes). The Mellah (old Jewish quarter) is near the royal palace and well outside the old medina. You will need to locate the caretaker if you want to enter the synagogue. 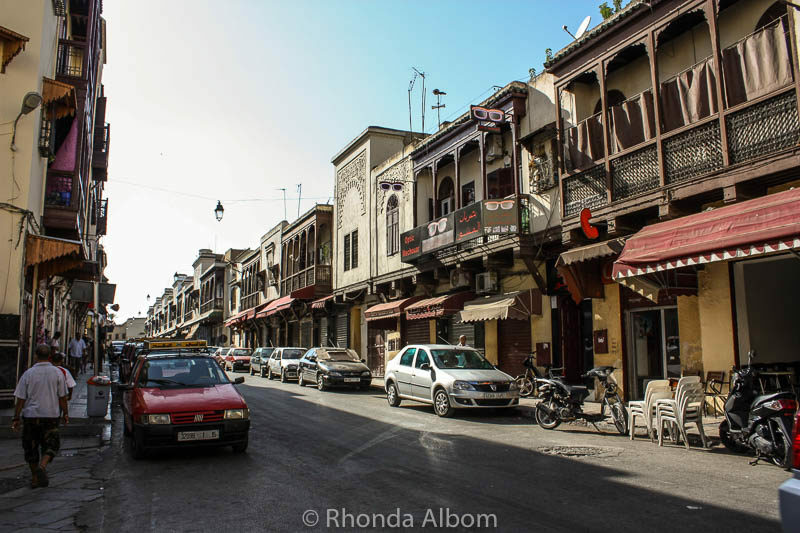 Since 1999, the Jewish quarter of Fes has been slowly undergoing restoration with the aid of UNESCO funds. This short video highlights the history of Jews in Morocco. 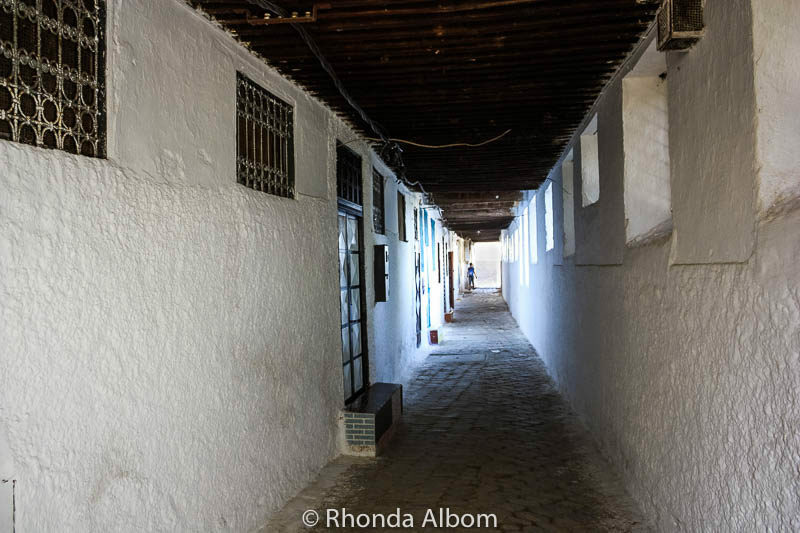 We stayed at Riad Al Atik in the old medina and recommend it if you are looking for a more traditional stay. If you prefer a more western experience, there is a Marriott and a Ramada in town. 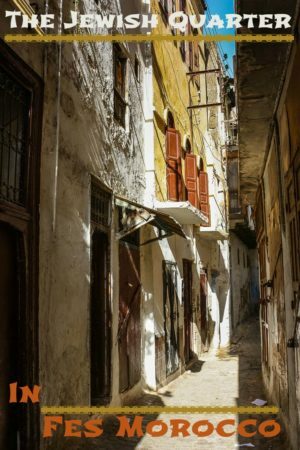 Have you been to the old Jewish Quarter in Fes? Did you know it existed? Spectacular place, Rhonda! Love the architecture in this place! Can you imagine what must have been like in its glory days? Another great post with beautiful photos. 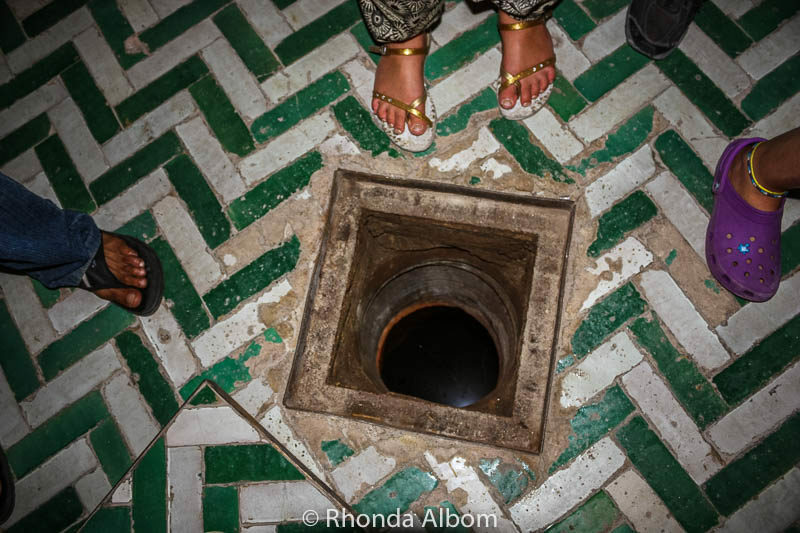 Even outside the medina, Fes felt like a tricky maze so I’m not surprised you need a guide. The Jewish quarter definitely felt distinct from the medina but we didn’t spend too long in the quarter on our tour. You seem to have seen far more than we did. Thanks David, I am thrilled people like my new look. We were not on a tour, so we had the option to spend as much or as little time as we wanted in each spot. We loved Fes, and returned for an extra almost week before we left Morocco. Beautiful pictures and the place looks fascinating for sure.I have always read mixed reviews about Morocco. Either people have liked the place or hated. Had no idea about the Jewish roots and good to know that it is funded by UNESCO. Unfortunately, Jewish population has drastically declined over the years. I am on the side of “love Morocco,” but I will agree, people seem to either love it or hate it. I was also surprised to learn about the Jewish history. 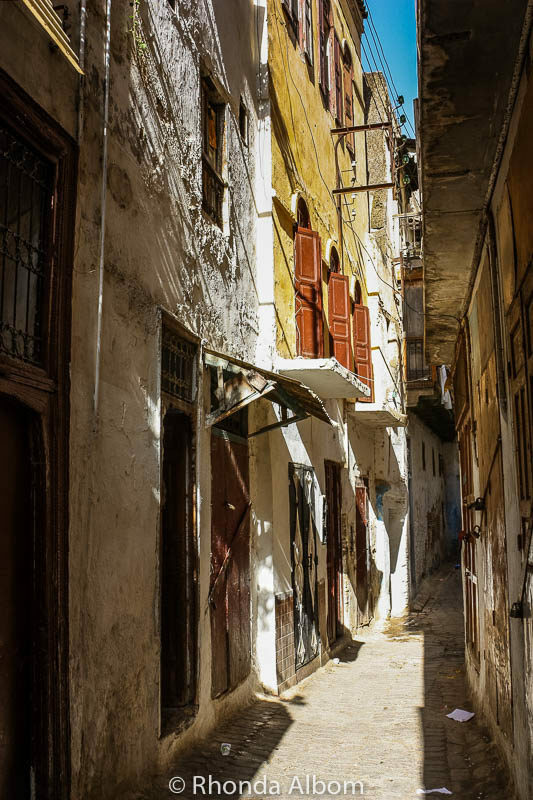 Very cool that the Jewish quarter of Fes has been recieving UNESCO funds – it looks like quite the fascinating area to explore. Really interesting mix of traditional architecture – I’m glad that your guide turned out to be knowledgeable and didn’t lead you astray! I thought so too, and was glad they are renovating it. I’ve only been to Tangier, and I am desperate to see more of Morocco. I’ve always wondered which of the imperial cities is best to visit, so I appreciate your candid insight into Fes. It looks amazing! Each has their own distinctive personality and you can take the train to each of them. Fes was our favourite followed by Rabat, Meknes, Marrakech and then Casablanca. However, Marrakech is really is a must see, even though it wasn’t a favourite. 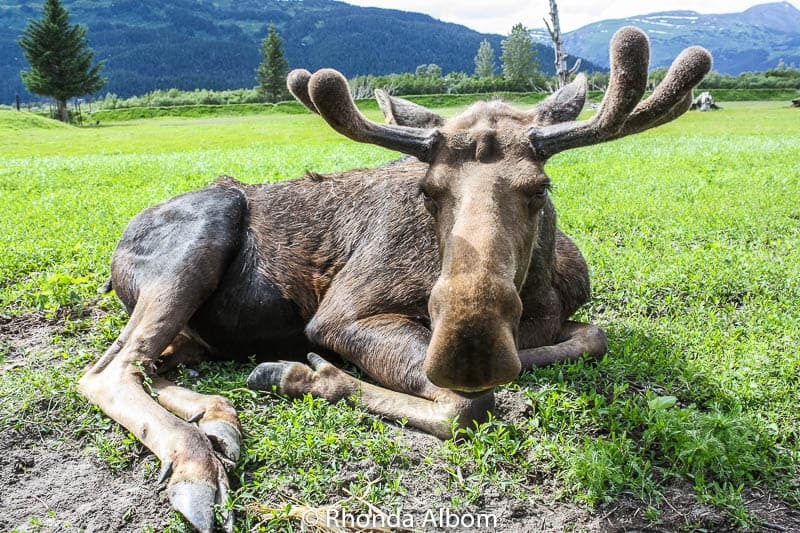 Oh, Rhonda, your pictures are so beautiful and so evocative of the places you visit! Morocco is definitely one of the places I hope to see before I’m too old to travel. I didn’t know there were so many Jews living there, but I am not surprised that Morocco declined after they emigrated to Israel. It happened in Romania too, in many parts of Bucharest where we had a lot of Jewish population. Plan the trip and go. Morocco is one of my favourite places I have visited. Everything about it was interesting and photogenic. I am guessing I have 1000s of photos from our month there. As for Romania, I didn’t know that either. I look forward to seeing your photos. I love Fes. We stayed there twice. Fes is one of the places I want to see in Morocco. I love how your pictures captured the scene and gave us a peek into your interesting adventure. Narrow streets usually lead to exciting experiences. We love to venture off the beaten path and walk the back roads of a city. Sometimes they lead to great adventure, other times not so much. How fascinating. Had no idea that there was a Jewish quarter in Morroco. It’s wonderful traveling and understanding the local culture. So rich in history with stories that don’t always make it out. Is there any reason why you could go into the cemetery? Glad you were able to get a guide for your visit. Truly interesting article. Thanks for sharing. There are Jewish quarters in each of the imperial cities of Morocco. I am sure there was a reason we couldn’t go into the cemetery, but no one told us. In Marrakech, only Jews were welcomed into the Jewish cemetery. I had no idea about this. Great shots of a lot of history. Thanks Sandee. Morocco had a thriving Jewish population at one point. What a fantastic day of exploring! I always love discovering small communities within a bigger community. Also: I can’t believe your husband accidentally went into someone’s apartment! Me too. We love going off the beaten path, outside of the tourist spots. And yes, it is one of those stories that is hilarious to look back on, but didn’t seem so funny at the time, at least not to hubby. Different from New Zealand in just about every way. I am not really into glamour shots unless that’s the mood of the neighbourhood. In Morocco we rarely went into the modern neighbourhoods, so what you see here, is what we saw. Amazing it’s from the 17th century! Fake guides is something I’ve never heard about Egypt. But at the pyramids I’ve heard there are plenty of pickpockets. 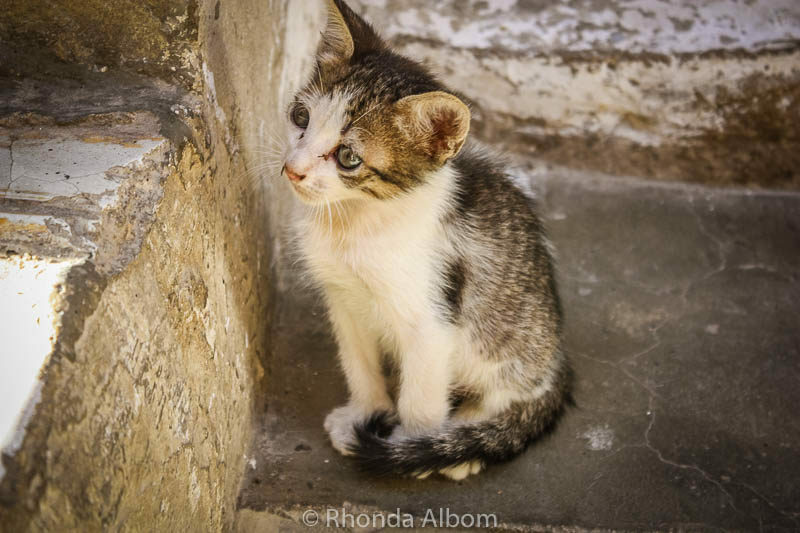 Stray cats are plentiful in Egypt, too. They keep the rat and snake population down, so shopkeepers often feed strays to keep them around. Thanks for sharing the great pics! I am surprised that Egypt doesn’t have the same false guides, but it is good to know, as one day we will get there. And, we will watch our pockets when we do. As long as you find the caretaker you will be fine. Very interesting Rhonda. Weren’t you scared dealing with the guide? One question my friend, why weren’t allowed to go into the cemetery? Have a beautiful Sunday Rhonda. See ya. We love meeting new people and learning about a culture. We talk to people everywhere we go and stay in more local accommodations, again to meet the people. So, no, we were not afraid. As for the cemetery, I am not sure why. He said it matter of fact, and we accepted it. 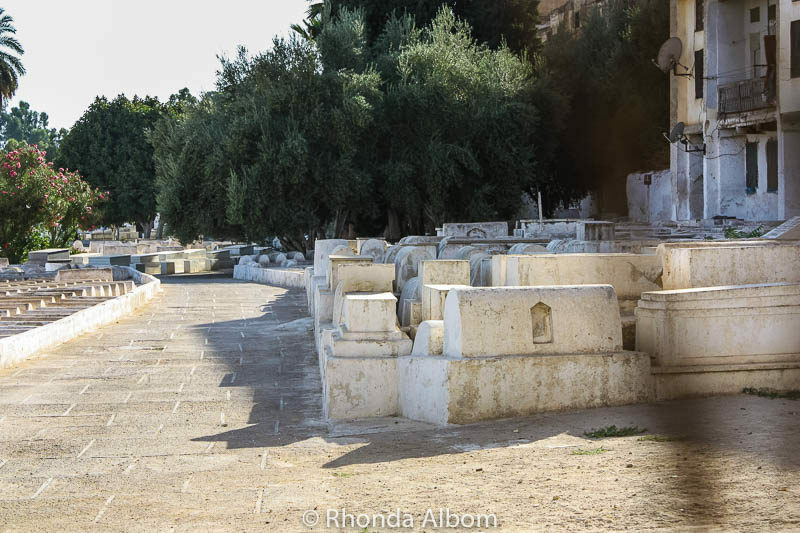 It was only when I was doing a bit of research before republishing and adding to this post that I discovered photos of others inside the cemetery. 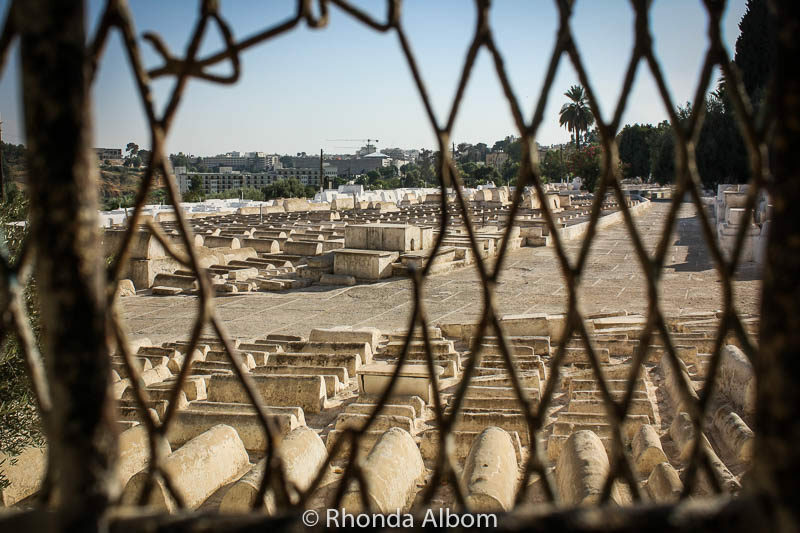 In Marrakesh, only Jewish people were allowed into the old Jewish cemetery. Our guide never asked us our religion. We love traditional Jewish food. I am sorry we missed that restaurant. Lucky you secured a knowledgeable guide or you might have missed all of that. Very true. There is little chance we would have entered that building as second time on our own. I’d love to visit someday. I really loved the balconies and building in the Jewish Quarter. What a wonderful experience! It’s an interesting contrast to the rest of Fes. 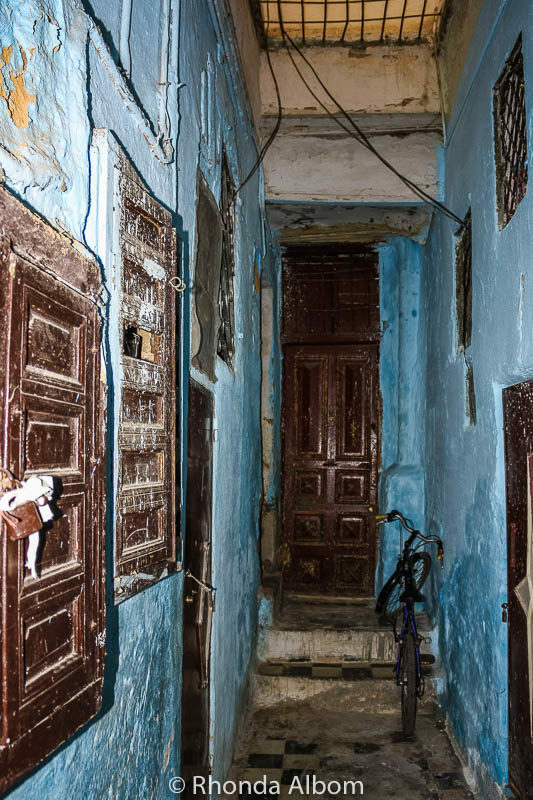 I’m stunned, because I didn’t even know that there was a jewish quarter in Fes, but I should have known, because they’re everywhere, like chinatowns. It’s amazing what you can find when you explore a city. I’ve never been to Fes but would like to go one day. Stray cats always break my heart though. So easy to have them spayed etc so you can stop the problem. I didn’t realise there were so many Jewish people in Morocco! I don’t know why I assumed that the Jewish population had to flee north when the Spanish insisted everyone be Catholic on their shores. True, many arrived during the Spanish Inquisition. There are only 3000 Jews remaining in Morocco. It looks fantastic. What surprises me most is how few people are on the streets. 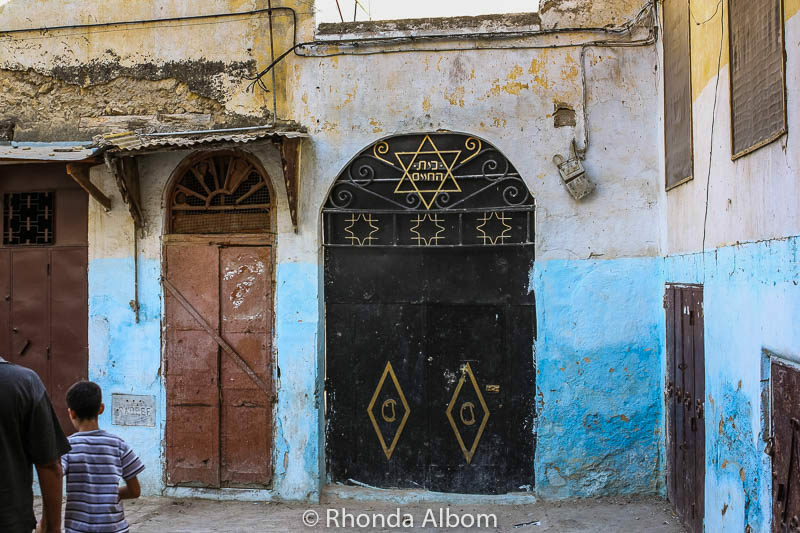 Marrakech has a Jewish quarter too, I wonder if it is like this one in Fez? Thanks Hilary. It is an interesting place. Thanks Leanne. It took me a long time to choose a tagline for the blog, and I think I did okay with the essence of travel through photography. Everywhere we went in Morocco is fascinating. Some of it more enjoyable than others, but all interesting. Can’t wait to wander around Morocco! The narrow hallways and the designs of it all seems so fun to navigate! Hoping to finally visit at the beginning of next year! Morocco is one of my favourite countries. I would go back in a heartbeat. If you are going to wander, prepare to get lost. It is half the fun but can take a while to find your way again. I don’t know the song, so I looked it up on YouTube. Cute and a bit catchy. What an interesting story! I love that your guide was on the up-and-up and not as the guidebook had possibly suggested. Great photos! It was an interesting day. And to be honest, there was some whispering between the girls and myself when hubby found the guide, but it worked out really well. Actually, Moroccan history is quite filled with both Muslims and Jewish people. It’s been since Israel that so many of the Jews left.